Another influential sports figure makes an appearance at The Sports Salon. University of Washington athletics director Jennifer Cohen will talk championship football, hoops and the dramas of her job. 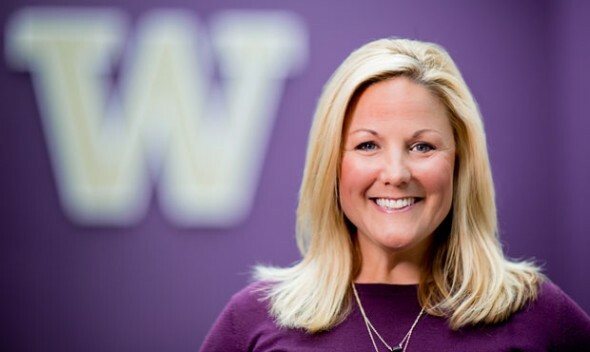 Jennifer Cohen has been athletics director at the University of Washington for almost a year, during which the football team reached the College Football Playoffs and the women’s basketball team reached the The Final Four. Not a bad start. She won’t take credit for the feats, but she will be delighted to explain how they happened and what they mean at The Sports Salon Jan. 24 at the World Trade Center Seattle. Cohen joins Sportspress Northwest’s Art Thiel in a happy-hour networking format, with good food and drink, to take audience questions in a casual atmosphere at one of Seattle’s premier waterfront locations across from Pier 66. A Tacoma native and lifelong Huskies fan, Cohen has been part of the UW athletics department for 17 years in multiple jobs. On Feb. 1, 2016, she succeeded Scott Woodward in the top job for a department with a $100 million annual budget that operates 20 NCAA varsity sports. Cohen played key roles in helping raise money for the $280 million renovation of Husky Stadium as well as in the hiring of football coach Chris Petersen. She will offer her insights into the issues of the college sports day, including NCAA reform, academic progress, the Pac-12 Networks, budget demands and gender equity. If you’re interested in the teams, people and issues surrounding UW and all of college athletics, please join us for an opportunity to ask and to learn — and to eat, drink and network. Advance tickets ($20 for World Trade Center members, $30 for non-members) can be purchased at Brown Paper Tickets here or at the restaurant door at the fourth-floor entrance.